WASHINGTON — Fairfax County leaders want to revise traffic forecasts for western neighborhood streets and the Route 28 corridor in the wake of a decision putting construction of the Bi-County Parkway on hold. Tuesday the Fairfax County Board of Supervisors voted to direct county transportation staff to detail what impact the long-debated Bi-County Parkway would have on Fairfax roads. The parkway would connect Loudoun County near Dulles Airport to Prince William County near Jiffy Lube Live. Supervisor Michael Frey says the traffic impact is just part of the issue that the county needs to consider when debating whether to weigh in on the Bi-County Parkway’s future. 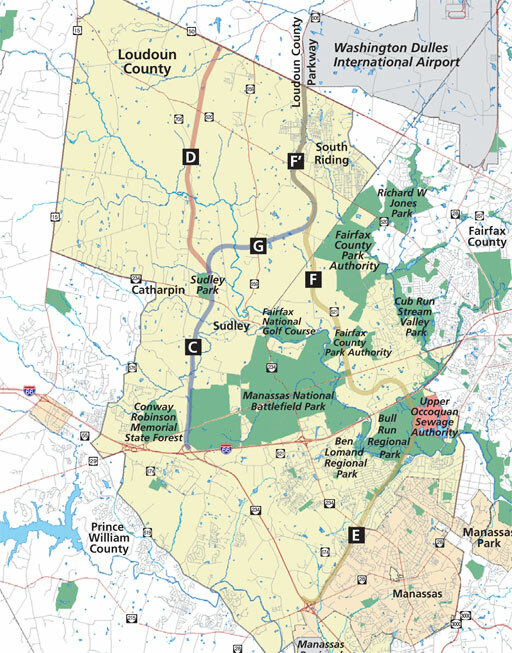 Fairfax still has a Tri-County Parkway, which would run east of Manassas National Battlefield Park, on its long-term planning maps. That project would connect all three counties and would keep traffic out of neighborhoods in western Fairfax County. “Traffic from our south and west today are forced to use old country roads and/or subdivision streets in trying to make their way into the Dulles area,” Frey says. The state chose the Bi-County Parkway route more than a decade ago as the best option to provide a new north-south connection between U.S. Route 50 and Interstate 66. The planned route would travel west of the battlefield. “As we are all well aware, Route 28 cannot handle today’s traffic, let alone what will come with the growth planned to the south and the west of us over the next 20 years,” Frey says. Last week, Prince William County Board Chair Corey Stewart told WTOP that projects already in the works for Route 28, and possibly a future Tri-County Parkway, are the only options to provide congestion relief if the Bi-County Parkway project is, as he sees it, completely dead. Fairfax County Board Chair Sharon Bulova says the board’s action is not intended to stake a position on the fate of the Bi-County Parkway. But the request to county transportation staff to analyze the impact of building or not building the parkway will help the county to advocate for its residents. The outlines of the traffic review will include what happens to local roads as well as the impact to the Manassas National Battlefield Park. The location of the road in relation to the park has been one of the controversial aspects of the plan. The Fairfax County Board expects to take up the issue again at an upcoming transportation committee hearing. Commonwealth transportation leaders say no final decision has been made on the Bi-County Parkway, and that it still awaits scoring under new requirements for unfunded transportation projects.